Ashegoda (Ethiopia) (AFP) – From the sky, the 84 glimmering white turbines at Ashegoda wind farm shoot up from the ground like massive spokes, standing out high amid vast expanses of yellow wheat. Ethiopia’s northern Tigray region, mostly populated by cattle farmers who grow the country’s staple grains, is an unlikely site for a modern French-run wind farm, let alone sub-Saharan Africa’s largest. With its multi-billion dollar projects in wind, hydropower, solar and geothermal energy, Ethiopia’s pioneering green energy efforts aim to supply power to its 91 million people and boost its economy by exporting power to neighbouring countries. “Ethiopia stands alone in Africa as using green energy for transformative growth,” said Ahmed Soliman, from Britain’s Chatham House think tank. Current energy production capacity stands at 2177 megawatts (MW), with ambitions to reach 10,000 MW by 2015. Ashegoda’s turbines, which tower above young boys in tattered clothes watching over their livestock, have a total capacity of 120 megawatts, making it the biggest on the sub-continent. The project was built by France’s Vergnet Group, and is the first of several planned wind farms in the country, including a 204 MW Chinese-built site under construction in the southeast. Ashegoda, 780 kilometres (484 miles) from Addis Ababa, is part of ambitious plans to transform Ethiopia into a middle-income, carbon-neutral country by 2025. The $313 million (230 million-euro) wind farm, funded by the French government and several private French banks, is an indication of growing interest from European companies in Ethiopia, where Chinese, Indian and Turkish investments are also growing. Both France and Ethiopia’s government are “very enthusiastic to reinforce even more links”, said Romano Coutrot, site manager at the wind farm, adding Ashegoda is one of Vergnet’s “most important” projects globally. The project took four years to complete and became fully operational in October, but faced several hurdles along the way. 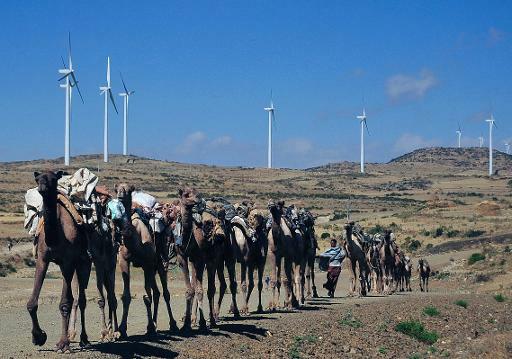 Soaring up to 80-metres (262-feet) high, the turbines had to be driven to landlocked Ethiopia on semi-paved roads from Djibouti, which posed a major challenge. Completion was further delayed to relocate the site five kilometres north after the aviation authority said it was interfering with its airspace. Coutrot admitted that doing business in Ethiopia can be challenging, with infrastructure shortfalls and crippling bureaucracy. “The taxation system, customs, the relationship with authorities, it’s sometimes a bit difficult,” he said, speaking from his office on site amid the imposing turbines. Ethiopia ranks 125 out of 189 countries on the World Bank’s ease of doing business index. “Government services like customs, land issues, other government services are improving,” said Minister for Water and Energy Alemayehu Tegenu, insisting the government was committed to improving conditions for investors. The government says its investment in green energy is a central pillar of its development plan, crucial in a country where the majority of people live on less than $2 a day. “Health, education, communication, water supply, industry, these all need sustainable and reliable power supply,” Alemayehu said. Only 53 percent of the country currently has access to electricity, with large swathes of Ethiopia’s rural regions in the dark and relying on firewood for basic household needs. “Unless you have this kind of ambitious plan, the pace of population pressure will take over and you won’t see any change,” said Belay Simane, professor of environment at Addis Ababa university. The country is already exporting power to Djibouti and Sudan, with a line to transport energy to Kenya under construction. Soliman said it will solidify Ethiopia’s role as a leader in green energy in the region. “Ethiopia will have a competitive regional advantage, not having to rely on economically and technically less-feasible sources of energy such as gas or oil to meet growing demands, which many East African countries are doing,” Soliman said. The hard currency earned from these power exports will go toward increasing the number of renewable energy projects in Ethiopia, according to the government. Heavy investment in the green energy sector extends beyond economics: the country is keen to avoid the mistakes of countries such as China or India, that experienced rapid economic growth but with grave environmental costs. “If we invest in these resources, we can develop in a green way without affecting the environment like they did in Europe,” said Fisseha Gebremichael, Ethiopian Electric Power Corporation’s Ashegoda project manager. Alemeyahu said he hopes Ethiopia’s aggressive investments in wind and other renewable energy resources will persuade other African countries to follow suit. “We don’t want to keep African populations in the dark for a long time, we have to run very fast to access light for industry and for social and economic development,” he said.